20 years ago, two-thirds of the world lived on less than $5.50 a day, according to the World Bank. Less than half does now. Equally dramatic is the reduction in extreme poverty (less than $1.90/day), from 30% of the world in 1996 to 11% as of 2013. China’s transformation is more remarkable still. If the poverty rate had remained unchanged from 1990 to today, rather than decreasing from 98% to 31%, 900 million more Chinese would live in poverty than currently do. Children being born on every continent and in nearly every country on earth are significantly less likely to grow up in poverty than their parents were. The 7 million richest people in the world (the top 0.1%) have taken home 13.8% of all economic growth since 1980, according to the 2018 World Inequality Report from the Paris School of Economics. That's as much as the poorest half of the world, or 3.8 billion people. Europe is the least unequal part of the world, but the top 10% of earners still capture 37% of total income. In the Middle East — the most unequal region — 10% of earners take home 61% of total income. "If established trends in wealth inequality were to continue, the top 0.1% alone will own more wealth than the global middle class by 2050," per the report. A recent OECD report examines how much of that wealth carries over to the next generation — it ranges from 20% in Denmark to 70% in Colombia — and calculates how long it would take someone born in the bottom 10% to reach the mean income in their country. 3 or fewer generations: Denmark (2), Finland (3), Norway (3), Sweden (3). 4 generations: Australia, Belgium, Canada, Spain, Greece, Japan, New Zealand, Netherlands. 5 generations: United States, Ireland, South Korea, Portugal, U.K., Italy, Austria, Switzerland. 6 generations: France, Chile, Germany, Argentina. 7 or more generations: China (7), India (7), Hungary (7), Brazil (9), South Africa (9), Colombia (11). The bottom line: The millions of people escaping poverty may find they don't have far to rise. Check out the full report, starting with the threat of a "hurricane-force cyber attack." Check out our video on why Pakistan is, as former acting CIA Director Michael Morell put it, "the most dangerous country in the world." Six people have been arrested in connection with an apparent drone attack, described by the government as a failed assassination attempt, which took place Saturday night as Venezuelan President Nicolas Maduro addressed the country’s national guard. Maduro’s government has accused Colombia and elements within the U.S. of undertaking a “right-wing” assassination plot. Meanwhile, some have speculated this was all a ploy by Maduro to justify further repression. Harold Trinkunas of Stanford’s Institute for International Studies says there’s no evidence to support either claim, but there was clearly a drone attack of some sort, and it “clearly surprised some people” given the chaotic scenes of soldiers fleeing and general panic. Another theory is that rogue actors from within the military were responsible. Trinkunas says a drone attack in that scenario, taking place at a major military event, is not as crazy as it might sound. A large-scale conspiracy would be nearly impossible to organize in the current climate, he says, so any coup attempt would have to be carried out by a small group of conspirators. What to watch: Trinkunas says regardless of who ordered the attack, Maduro will “try to use this to his advantage,” with further crackdowns on the opposition and purges in the military. American University's Michael McCarthy, meanwhile, writes for Axios Expert Voices that "the pressure against Maduro is coming from within his movement as much as from the opposition," and will only grow after this "embarrassment." Go deeper: Venezuela's manmade economic crisis. The bigger picture: Many Rohingya, a majority-Muslim ethnic group often described as "the world's most persecuted minority,” now live in limbo. Residents of Zero Point have not been given refugee status, as the area in which they have been sheltering for almost a year now is officially under Myanmar control — but a fortified border fence rigged with landmines makes a return to their villages in Rakhine state an impossible mission. This is the third time Nur al-Amin, who used to own paddy fields in Myanmar, has experienced displacement. The first was in 1978, when he was still a child and had to spend a year at a refugee camp in Bangladesh after escaping anti-Rohingya violence by Myanmar's authorities. Then in 1992, he was forced to flee for a second time and ended up living as a refugee for eight years. 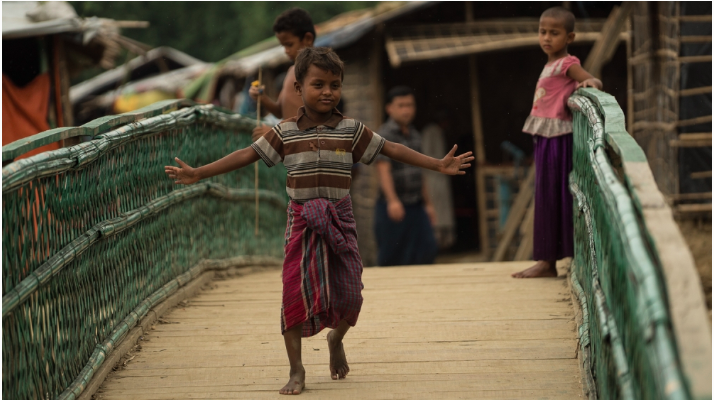 The bottom line: "When we first arrived, we thought that after a few days we would return back to our homeland," says Dil Muhammad, the Rohingya camp leader. "One year has passed, and there has been no solution. The UN has failed us." Go deeper: Mass graves and ethnic grievances in Myanmar's Rakhine state. Eritrea subjects its people to mandatory and indefinite national service, and shuts itself off to the world. But things seem to be changing in "the North Korea of Africa," the Economist reports, after an unexpected thaw with neighbor and rival Ethiopia. What to watch: "If Ethiopia is no longer a threat, why should Eritreans spend decades doing national service? If Eritrea is no longer on a war footing, why does it need a military strongman to keep it safe?" Nearly five years into South Sudan's civil war, the leaders of two warring factions say they have reached a power-sharing agreement. If it holds, that's fantastic news for a country facing one of the most dire humanitarian crises on earth. Over 3.5 million people — one-quarter of the population — have been displaced from their homes, and both sides in the war have been accused of atrocities. Saudi Arabia has frozen all new trade and investments with Canada and is expelling its ambassador in retaliation for a tweet by the Canadian Foreign Ministry, which called for Saudi authorities to release imprisoned human rights activists, Axios' Zach Basu writes. The big picture: Crown Prince Mohammed bin Salman has garnered praise for his efforts to modernize the Saudi kingdom, but the reforms have come amid a ruthless crackdown on dissidents like women's rights activist Samar Badawi. The backdrop: Badawi (pictured), the recipient of the 2012 International Women of Courage award, is one of at least 15 human rights activists and government critics to be arbitrarily detained in Saudi Arabia since May 15, according to the UN High Commissioner for Human Rights. On Aug. 2, Canadian Foreign Minister Chrystia Freeland tweeted that she was "very alarmed" to hear Badawi had been detained. The next day, the Canadian Foreign Ministry called for her "immediate release." Saudi Arabia's Ministry of Foreign Affairs issued a statement Monday expressing "disbelief" over the comment, calling it "a blatant interference in the Kingdom’s domestic affairs." In addition to freezing all new business and declaring the Canadian ambassador persona non grata, Saudi Arabia also plans to withdraw all 20,000 Saudi students studying in Canada, according to The Globe and Mail. They will reportedly be moved to similar programs in countries like the U.K.
Worth noting: Annual trade between the two countries is worth about $3 billion. In a background briefing for reporters on Monday, a senior Trump administration official boasted that, because of sanctions, the Iranian currency "is tanking, unemployment in Iran is rising, and there are widespread protests over social issues and labor unrest." The administration refused to take responsibility for the humanitarian damage, placing the blame on Iran’s government. Officials also continued to claim that the U.S. is leading a “coalition” against Iran, even as European allies were decrying U.S. actions and vowing to maintain the deal despite U.S. sabotage. The main beneficiary of the U.S.' Iran reversal is China, which became Iran's top trading partner more than a decade ago. Beijing has already told the Trump administration that it will not reduce Iranian oil imports after the slated return of oil sanctions on November 4. The big picture: The Trump administration hopes the sanctions will curb Iran’s "malign" activities in the Middle East, but there's little likelihood of that result, especially since Assad has “won” in Syria, and Iran’s regional rival, Saudi Arabia, remains bogged down in Yemen. Although widespread protests have erupted in Iran since late last year, there are no assurances that Iranians will overthrow their government and replace it with one more attractive to Washington and its allies. The bottom line: Iranians will suffer, but the U.S. is unlikely to benefit. Children worldwide are less likely to die young than ever before. Thousands of women and children are returning from ISIS. Report: Saudi coalition in Yemen working with al-Qaeda. Inside Russia's invasion of the U.S. electric grid. U.K. to ask Russia to extradite Novichok poisoning suspects. Turkish currency hits all-time low amid U.S. pressure. Why China hasn't followed Russia on disinformation — yet. "Now, someone is going to say a grand chef who drinks Coca-Cola, that can't be. But I also use ketchup. One must be open to everything. Sometimes, you feel like eating a pizza; the next day, you may feel like couscous or paella, then, the day after, you eat some more refined cuisine. All of it is necessary." — Joel Robuchon, the renowned French chef who has died at 73, speaking to the LA Times in 1996.